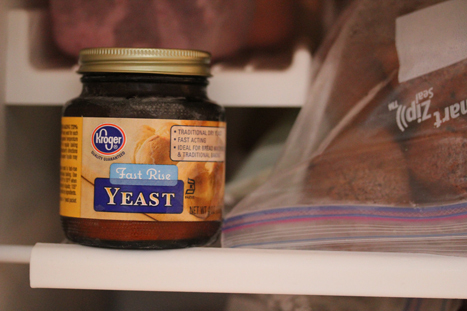 Store your yeast in the freezer! It is certainly cheaper to purchase a jar of yeast than to purchase the strips. If you are planning to make more than 3 loaves of bread or 3 batches of dough for rolls, pizza crust, cinnamon rolls or other yeast bread, then the jar is the way to go. It will store safely for up to a year in the freezer. And yes, the little yeast will be just as active after a year in the freezer. What is your favorite yeast bread recipe?! I am glad you put this on here. I made homemade white bread and cinnamon rolls and couple of weeks ago and wasn’t for sure if I could freeze the yeast or not. When you go to use the yeast should you let the yeast sit out a bit to warm up before using it or is it okay to go ahead and use it? I buy yeast by the brick (Sam’s Club), so this is a very helpful tip. Thanks for sharing! Just yesterday I asked this question, as I have a stash of coupons and wasn’t sure whether to stock up or not. I always keep it in the refrigerator and have found I have to let it get to room temperature for it to work well. I get my yeast from Sam’s by the brick and store it in the freezer. I use it straight out of the freezer and have never had a problem. Much cheaper than the jars in the grocery store! I highly recommend buying your yeast at Sam’s club. I paid $4.38 for 2 pounds of yeast at Sam’s as compared to $6.78 for a 4 ounce jar at my local grocery store. Granted, I do bake pretty often. I try to make our sandwich bread instead of buying it. Costco is another good source for yeast in bulk. I got 6 cups of yeast (I know because it is stored in 2-cup containers) for under $5. Froze 2 containers and kept 1 in the frig. Way cheaper than the grocery store. Even if I end up throwing 1/2 of it away I am ahead of either individual packets or even the much small jar at the grocery store. What’s the shelf life difference between storing yeast in refrigerator vs freezer? If you don’t have a warehouse club membership but want to buy yeast in bulk, try a restaurant supply store. The one around here is GFS, and its open to the public. A 2-lb brick is about $5. Homemade bread doesn’t contain HFCS like most store bought bread does!